Abdominal bloating is not a medical condition per se. Instead it is only a physiological response of the body or a sign of many illnesses that affect the gastrointestinal organs inside the abdominal cavity. The synonym for abdominal bloating is abdominal distention. This is actually a physical finding and the term that refers to enlargement of the abdominal area. It is possible for people to feel bloated even though there is no obvious distention of their abdomen. This particularly occurs after a large meal. Distention is, on the other hand, always accompanied by noticeable enlargement of the abdomen and is most commonly associated with more complex medical issues. The abdomen can enlarge due to excess of air, fluid or due to some growths/organ enlargement inside the abdominal cavity. The problem is either transient or permanent in which case one needs to report it to his/her health care provider. What are Causes of Abdominal Bloating? 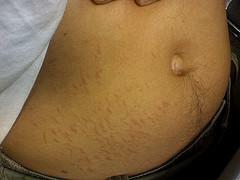 Abdominal bloating can be associated with many factors and illnesses. It may be rather unpleasant and accompanied by several more symptoms and signs. In women abnormal bloating is most frequently a consequence of premenstrual syndrome. It develops before the onset of the menstrual cycle and lasts for several days. Furthermore, abdominal bloating is only one sign of irritable bowel syndrome. It can be additionally associated with constipation, particularly if the problems lingers for some time. Unfortunately, in some cases abdominal bloating is a sign of more complex and severe medical conditions such as bowel obstruction, cancers, liver or kidney disorders. Several more factors which contribute to abdominal bloating are alcohol consumption, excessive salt intake, lack of protein intake, lactose intolerance and other types of food intolerance, food allergy etc. People can easily avoid abdominal bloating associated with some foods by reducing, if not completely eliminating troublesome food products from their diet. Foods which are closely related to gas and flatulence are vegetables such as cauliflower, cabbage, broccoli, corn, asparagus etc. Intake of wheat, beans and legumes has the same effect. So by eliminating such foods from the diet, the problem can be completely prevented. People with food allergies and intolerance must stay away from the food they are sensitive to. If, however, the problem persists it is best to consult the doctor and see what the underlying cause of abdominal bloating is. Once the condition is identified, the patient receives appropriate treatment. Finally, women inevitable face bloating prior their periods and there is no efficient cure or remedy for this problem. Fortunately, bloating in this case is not severe and lasts only a few days, resolving on its own. Can anyone help me? 3 years of bloated stomach, Headaches and constant belching.